Custom Cut Acid-Free Photo Name Mats and Specialty Cut Shaped Mats using our Wizard Computerized Mat Cutter. At The Framer's Workshop we specailize in the design and cutting of custom mats. You can choose a simple name mat, a template mat opening from our Wizard design library, cut art mats, original custom mat designs, or a combination of design elements. Everything you see here and on the four linked pages below is for inspiration. We don't include a shopping cart for our mats because each mat is a unique creation. Instead, we invite you to send us an e-mail or give us a call in Berkeley, California at (510) 849-4444. We'll find out exactly what you have in mind, and we will design and cut your mat to order. We can usually ship within 2-3 working days.Original designs may take a bit longer. We like hearing from you personally and we will give you great service in return. If you see a mat that you would like to duplicate from another page on our site, we can cut that as well. 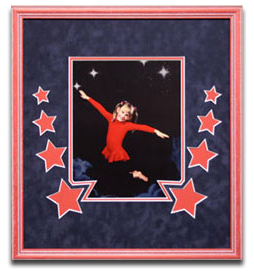 For fabric matting, including silk and suede mats, see our Framing Examples Page. Shop Online: "I ♥ You Grandma," "I ♥ You Grandpa," "Merry Christmas," and "Happy Chanukah." Make sure to view each of the specailty mat pages linked from this page for more examples, ideas, and sample prices. Create a truly unique gift with our letter name mats! Choose your text and graphic, assemble your photos, and we’ll help you put together a gift that is sure to please everyone on your list. You’ll be able to view more name mat examples and choose letters and shapes on our Name Mat Page. Order the perfect mat from over one hundred Wizard and Brain Wolfe template designs. 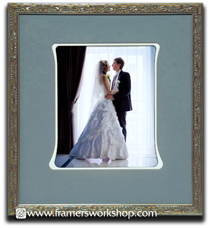 Perfect for Signature Mats, Wedding Photos, fine art on paper, and any special occasion. Styles include Art Nouveau and specialty V-Groove mats. 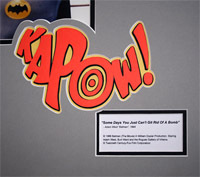 Cut Art Mats are created from a combination of Wizard template windows and Wizard Cut Art. Choose from hundreds of cut art shapes to make a truly unique mat! 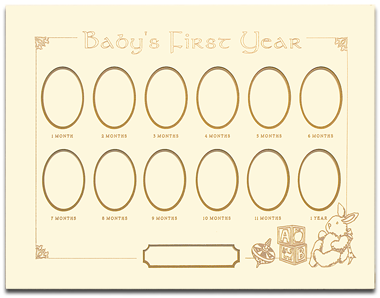 Lisa Marie from PA makes these hand-designed gold-lettered "Baby's First 12 Months" mats for us. Double mats, cream & gold with an acid free foam core backing, $75. They make great gifts! !